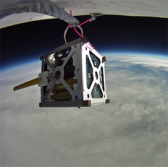 NASA has started to checkout and commission a small satellite that is designed to demonstrate the capacity of CubeSats to gather scientific data. The agency said Tuesday its ground controllers began checking out the Dellingr CubeSat a few hours after the spacecraft was launched into low-Earth orbit by a NanoRacks-built CubeSat deployer aboard the International Space Station on Nov. 20. Michael Johnson, chief technologist of the applied engineering and technology directorate at NASA’s Goddard Space Flight Center, said Dellingr will work to validate the use of small satellites for important and “never-before-tried” science missions. Johnson noted that CubeSat platforms historically demonstrated a success rate of approximately 50 percent. The Dellingr team began work in 2014 with a goal to boost confidence in the reliability of CubeSats. Dellingr will employ a suite of miniaturized instruments and components to collect data on the sun’s impact on Earth’s upper atmosphere.